I know, normally Pasta Puttanesca has anchovies in it, but it's plenty easy enough to make without. You won't even miss the annoyingly salty dead fish. Do make sure you include the capers though, even if you're not sure you'll like them. They totally make this dish. Lightly saute the garlic in olive oil for a minute or two - really, just warm it enough to start it cooking, do NOT brown! Add the basil, capers, olives and red pepper flakes, and cook for another two minutes. Reduce heat to low, and add the brine and tomatoes. Cover and simmer for at least fifteen minutes. 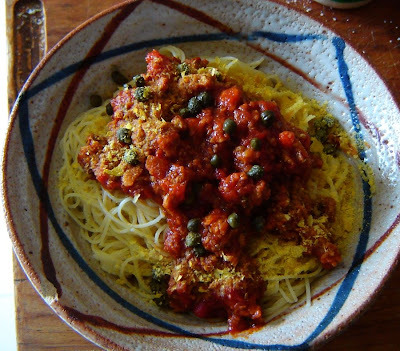 Serve over pasta, sprinkle with Nutritional Yeast if you want and I always add a few more capers (no, those are not overcooked peas in the picture! Please!) 'cause I love the things!! I may just have to try this, but, well, I've never had capers and I already know I'm not fond of olives. Who knows, we'll see. Looks great though! That looks amazing! I've never had Puttanesca, but I want to try it now! Oh, and I love capers! Yum! That looks really good! A little trivia for anyone who's interested: "Pasta alla Puttanesca" literally means "Pasta the way a whore would make it". Haha! absolutly delicious, I'll be sure to try this this evening, thanks for the recipe!! I have to have it at least once a week or I will die. That's right, I will DIE without pasta puttanesca. There I said it. tried your recipe two days ago....it's just amazing!!! This looks so good, and easy, too. We will definitely need to have it soon. Thanks for another great recipe!